It is comedic, bordering on farcical, that this country will agonise over the disposal of the 25% stake in Aer Lingus – worth about a lousy €175m – whilst at the same time largely ignore sales of assets worth many multiples of this. Today, the British commercial property portal, CoStar.co.uk reports that AIB has sold €600m of assets in Poland. The Irish state owns 99.8% of AIB, so these disposals are of OUR assets. The buyer appears to be a joint venture between two non-Irish companies, Peakside Capital and Partners Group. The purchase price appears to be €600m. What was the sales and marketing process, and was it adequate to maximise the sales price? What were the assets worth in AIB’s books at 30th June 2012? Did we make a profit or loss on the deal? Who knows, who can tell. There’s nothing on the Investor Relations section of AIB’s website confirming the sale today, though there was a press release without specified figures in April 2012. The Government/Department of Finance didn’t announce the sale, and there’s bugger- all reporting in the Irish mainstream media. When the Sinn Fein finance spokesperson Pearse Doherty recently asked the Minister for Finance Michael Noonan about a schedule of assets for sale in Irish state-owned banks, he was practically told to get lost and that such information was confidential. It seems that political oversight will be reserved for the sale of the 25% stake in Aer Lingus. In addition to those accounts in arrears, there are at least 40,221 accounts which have been “restructured” which means they may be paying less than contracted, may be paying interest only or indeed may be paying nothing at all. The data this morning means that 16.2% of Irish mortgages are in arrears for more than 90 days or restructured, possibly not making any payments. And that 22.1% are in arrears or restructured. The mortgage crisis is getting worse. However the pace of increase has slowed down, and the quarterly increase in arrears over 90 days of 5,621 is back at 2010 levels of increase. Also those getting into short term arrears – which would be expected to influence future 90-day plus arrears – has reduced. So the mortgage arrears problem is getting worse but the pace at which it is getting worse has slowed down, and this is now the second quarter of deceleration, so we might have the beginning of a trend. It is perhaps the only bright spot in an otherwise dismal set of numbers. 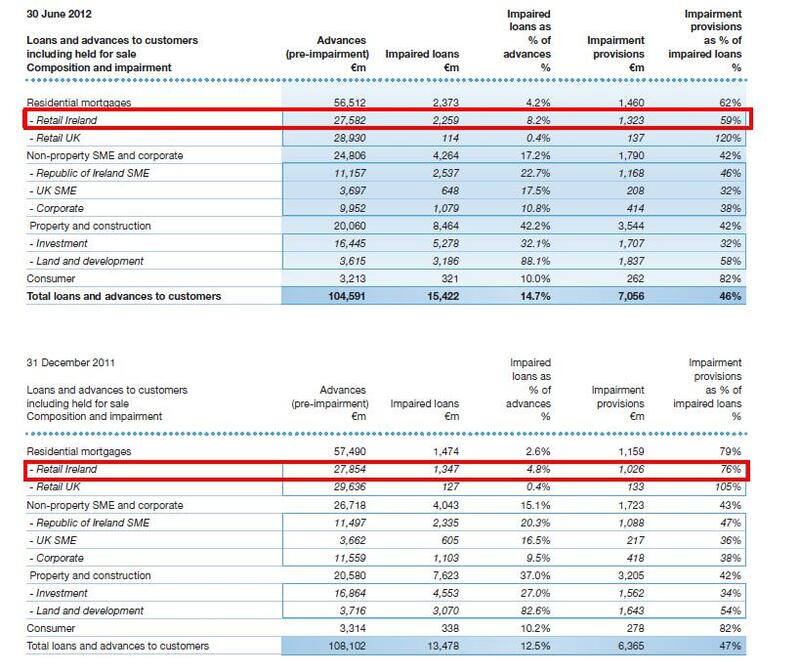 The view on here is that there is a latent mortgage crisis in Irish banks and that the 68% increase in impaired mortgages recorded in the Bank of Ireland accounts for the first six months of 2012 is just the beginning of banks recognising the scale of the problem. Repossessions have reduced slightly from 170 in Q1, 2012 to 146 in Q2,2012 and in an Irish context, repossessions are practically non-existent. The belief on here is that the recently published Personal Insolvency Bill will not substantially affect repossessions as the bank remains the ultimate gatekeeper in deciding if someone can pursue bankruptcy. Compared with our neighbours in the UK, we can see that there is little appetite in Ireland to deal with the mortgage crisis where people are unable to repay their mortgages. Despite our mortgage arrears rate being a staggering five times that of the UK, our repossession rate is less than a quarter of the UK rate – in other words, you are 23 times more likely to have your home repossessed in the UK compared with Ireland. Last October 2011, President Bill Clinton identified the mortgage crisis in Ireland as being the “number one” economic challenge facing this country. 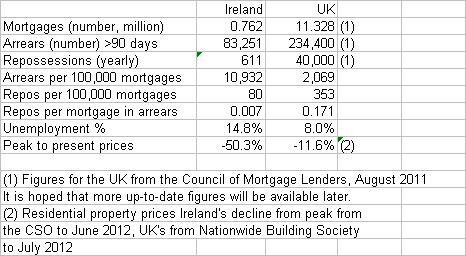 Nearly a year on, with a next-to-useless Keane report and minor tinkering around the edges of forbearance measures, and the publication of a largely useless Personal Insolvency Bill, we are really no closer to dealing with the reality of property declining by 50% from peak, unemployment soaring to 15% and take-home income being reduced. The risk for dangerous unintended consequences – like strategic default in anticipation of “proper” measures – mean the Government needs to get to grips with the problem now.